I've had the same showerhead in my apartment since I've moved in. I thought it was time for a change. Showering is essential, so why not do it in style? Bricor is a company which sells different models of showerheads that perform excellently. The showerheads are of great quality and work for anyone's taste. I was sent the "Bravo" model. Patented air induction and Vacuum Flow Venturi Physics to create an astonishing 1.375gpm @ 50psi. FIT® tested for maximum flow strength deliver. Performance rated for maximum efficiency. Air Induced Vacuum Flow Venturi Physics inside the BRICOR Knuckle TM linearly accelerates the flow stream of the incoming water supply. I really like this showerhead. The modern look of it is very nice and it looks great in my shower. It was very easy to install and stayed on securely and I had no problems with any water leakage or unsecureness of it at all. The stream of water is strong and the water flows very nicely. I would recommend this showerhead to anyone looking for a low-cost, great showerhead. 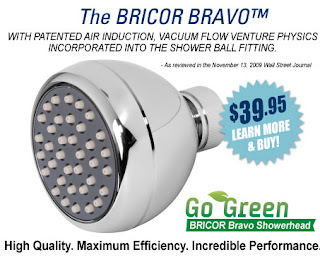 I will be picking ONE (1) winner who will win a Bravo showerhead. Winner will be chosen on January 8, 2011 at 10 pm and then will be emailed. I need a new showerhead. The one I have does not work good. I would like to win this showerhead to replace the older shower head I have. I would really like an efficient shower head. I would love to win this because our showerhead is all gunky and gross, and no amount of cleaning will make it better! I'd love to win this - my old shower head definetly needs to be replaced and this looks really cool! I would like to win this, because we need a new showerhead in our master bedroom! Subscribed to your blog via RSS Feed Reader. I would love an efficient showerhead. First,I've lived with the same showerhead that came with our house for the last 17 years. Secondly, we have hard water and it produces a lot of mineral build up which doesn't help with the water flow. I follow/friend you on facebook. I would like this because my current showerhead is 15 years old and is needing replaced soon. Our current one is SO powerful it shoots the curtain up and it's so annoying! I'd love this one. Wow I'd love to win this for my parents. They have done so much for me and now I am doing for them. I clean their house once a week and make meals for them as well. Their upstairs bathroom does not have a showerhead or toilet that works. I am working on it. Our showerhead needs replacement. You can't turn it anymore so you can't change the types of flow. I want to win because I want to have a greener showerhead. I would like to win because our showerhead is old and rusty. I would love to replace it! I would like to win this to give to my aunt and uncle. Showering at their house is like being beat with hail! The cheap plastic showerhead that came with my bathroom has seen far better days long before I moved in. This Bravo showerhead looks amazing and would be a fantastic improvement. Thank you for the chance to win. Happy New Year. I'd love to win this since it's so energy-efficient. This would be really nice to have...ours is so outdated now. I'd love a new showerhead. Ours is old and often sprays out from the side, shooting water over the top of the shower curtain. Grrr! My showerhead is old and not that effective. This one looks great. I would love to win because all of our shower heads are old at it would be great to get a new one. My showerhead has been here since 1975 and I would love a more updated look. I would like to win because I need a new showerhead in my bathroom. Mine is falling apart! I need a new one, mine is so old! Thanks for the chance! I dont like my current showerhear it doesnt let off any pressure and I could really use a new one! I like that it's efficient and has good water pressure! I would like to win this because as of 2 days ago my current shower head no longer sprays and my 5mo baby screams when she is given an actual bath. I live out in the country and have well water, so over the course of use, rust and other sediment from the well plug the different holes on the shower heads so currently I only get water pressure from half of my shower head. I could really use a new one! i just think it would be nice to have a nicer shower head. ours came with the house and it is one of those spit/spray jobbers. there is always something more important to do with the old budget,than 2 get a new shower head! I want to win this showerhead because the one I have is turning rusty and crusty. Its time for a new one and this one sounds pretty fabulous. My current showerhead is useless. I'd like to win because I do not have a functioning shower head. I'd love to win this ~ I'm trying to go "green" this year and this looks realy efficient! Thanks for the nice giveaway! I would like to win this showerhead to give it to my granddaughter who has just moved into an older apartment with one that looks old as the hills. I want to win this because mine is old and doesn't work well! We are starting the process of updating our bathroom and this would be a nice addition. Because my current shower head feels more like a slow trickle from a kettle than an actual shower. I would like to win this because our showerhead is old & outdated! I would like to win this so I can have an updated one because mine is old as dirt! my showerhead is old and crappy :( i could really use a new one! I would love a new showerhead, my house nad bathroom are pretty old! I'm moving soon and would love to start off clean and green in my new place! Our showerhead just started leaking so this would be great to win! I'd like to win this because it saves water! Our shower head is old and it keeps falling off. Mandatory Entry: iwant to win because my shower hed leaks!